The following is a presentation of my concept of a Double Sziklai Voltage Regulator – with a very high error amplifier gain and presumably low noise. My question to you is the following: Will it work at all ? Will it be stable or will it oscillate ? Will it ring on the edges of a square wave load pattern ? I kindly ask of you to send your comments, remarks and suggestions with regard to this concept. Q2 – is a current source providing a stable current for the Zener Diode D4, which in turn is the source of my reference voltage. C2-R9-C6 – is a low-pass noise filter network, supposed to ‘filter out’ the noise generated by the Zener diode D4. 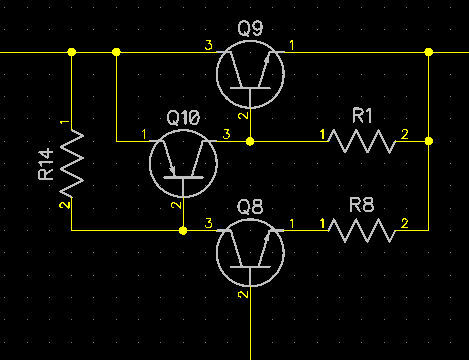 Q24-R4 – is a Constant Current Drain for a Differential Amplifier that sits on top of it. Q1-Q13-Q17-Q18 – constitutes a Differential Error Amplifier, with Sziklai style complementary compound transistors (with the resulting huge gain). 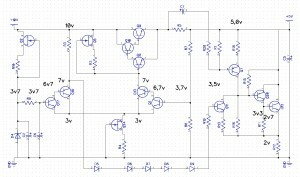 Q6-R2 – is a Constant Current Source, for the right hand side of the differential amplifier. It’s current shall be set to be 1/2 of the current of the Constant Current Sink Q24-R4 that serves the whole differential amplifier. 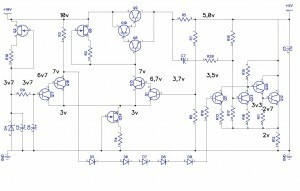 R3 – is a simple load for the left hand side of the differential amplifier. Q8-Q9-Q10 – is a “compound double Sziklai” topology which I came up with – with the hope of a very low intrinsic dropout voltage capability, and with an ultra-high gain (… and probably this topology, due to the huge gain, will need to be extended by some additional resistors, which provide more bias current for the driver transistors within). R5 – is a small valued serial resistor, providing a small little amount of voltage drop, that I need for a circuit as described below. R6-R7 – constitute a voltage divider, that provides the feedback voltage for the differential error amplifier Q1-Q13-Q17-Q18. Q12-Q20 – is the core part of a “compound double Sziklai” topology with a very high gain” … but this time – it is of the weird variety: it is “controlled” by two independent driver transistors, each serving a different purpose … (hopefully). Q11 – is the second driver transistor of the (same!) compound double Sziklai as above; It receives a fair share of the source side originating voltage ripple that appears on the input of the regulator. This ripple is transmitted, together with the amplified error signal from the differential error amplifier, via diodes D5~D9 – R19 and delivered as a bias voltage of Q11. The purpose of this “fair share” of input side ripple and error amplifier signal being fed into this transistor is to reversely modulate the shunt function of the Q11-Q12-Q20 compound double Sziklai so that it fully compensates such ‘source-induced’ ripple, but also performs the function of a “shunt regulator”, as the resistor R5 also serves as a serial resistance for such a shunt regulator. In essence – what I hope to have achieved here is the best of both worlds … a sort of “serial linear regulator” … but also with a section that is a “shunt” in it’s nature – and fed from the other differential leg of the differential amplifier. 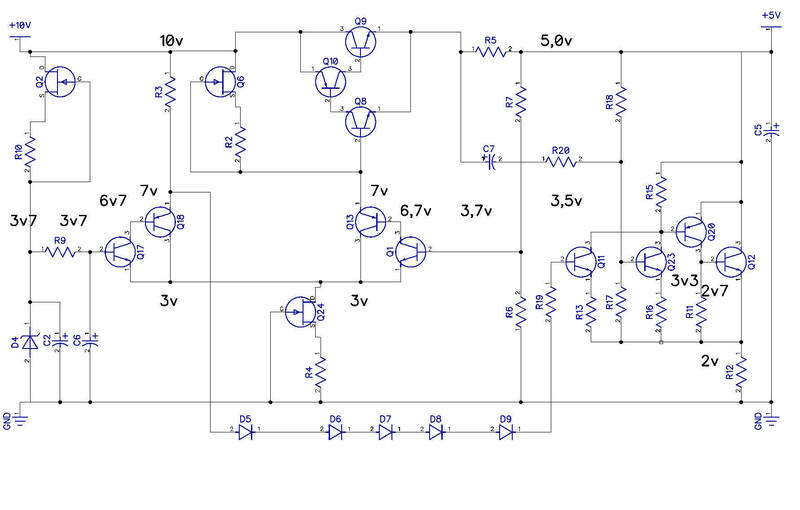 So it is, in my humble opinion, a SERIAL-SHUNT regulator, with load-induced ripple cancellation, and some additional line-induced ripple cancellation. That is what I HOPE it is. Or … or maybe it is a signal generator ? The values of the resistors are not shown, as the whole concept is sort of like very fresh … but within the first diagram I signaled some possible target voltages within the circuit. Notwithstanding that there is a 5V dropout between the Q8-Q9-Q10 and R5 … I believe that such a double Sziklai compound transistor group should be capable of operating correctly with a dropout as low as even 1,0 VDC (0,7V+0,3V). Please help me with this project, in fine tuning the details. Any conceptual errors here ? Is this a killer design, or is it a bummer ? P.S. 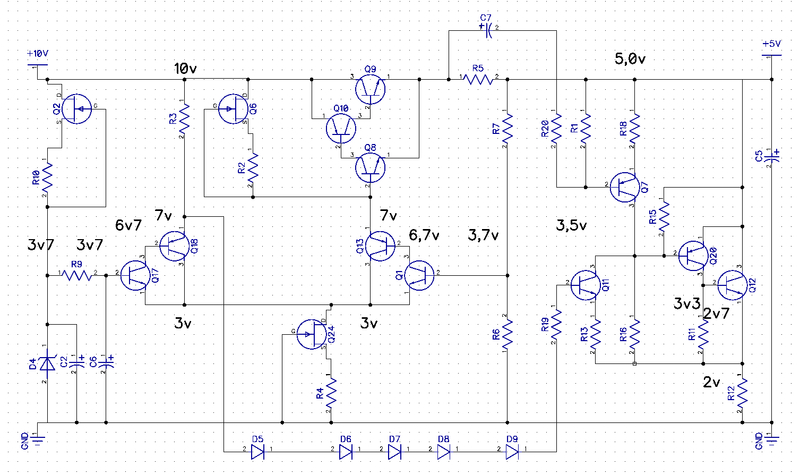 Here is a slightly modified version, with a somewhat different setup of one of the shunt Shiklai driver transistors. Now it should be more responsive to the changes of load current induced voltage drops.